Wahunsenakah Lodge held their first event of 2013, the Winter Service weekend at Bayport Scout Reservation, on February 22-24. 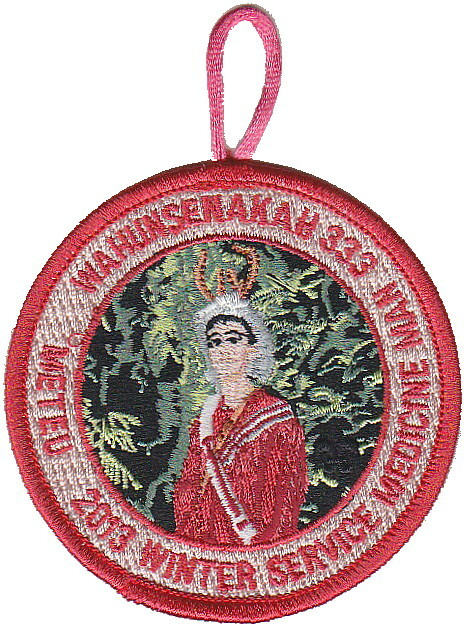 The 3" round patch includes a pocket loop and features a Scout playing the role of Meteu. Colonial Virginia Council recently issued their 2013 Friends of Scouting CSP, tenth in the Scout Law series which began in 2004. The theme of this year's patch is "BRAVE" and the design features a Boy Scout and a Cub Scout saluting a soldier silhouetted against a setting sun. The patch is apparently from a different manufacturer than its predecessors since the size is several millimeters smaller in width. 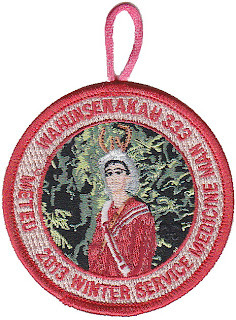 You can add this patch to your collection with a $75 contribution to the Council. Check out all of the patches in the Scout Law series on the CVC Friends of Scouting emblems page. 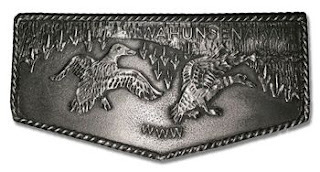 At their annual Holiday Banquet on December 1, 2012 a new pewter belt buckle for Wahunsenakah Lodge was sold for the first time. The design mirrors that of the Lodge's official service flap, the S2. 100 of the buckles were made, and they were sold for $15.00 each. The buckle was manufactured by the Witch Trail Committee of Mansfield, MA. This nonprofit group was originally formed in 1968 by a Scout troop that set out to research and document an historic trail as a troop project. Since the Freedom Trail in Boston already existed the troop decided to document the history of the witch hysteria of the 1600's in nearby Salem. After submitting their report to the national office the Witch Trail was declared an historical BSA trail. It was the first of nine trails researched, documented, cleaned, and marked by the group, which supports itself through the sale of books, patches, and pewter medals for each of the trails. The group also designs and creates custom pewter bolo ties, buckles, medals, and medallions, specializing in Order of the Arrow, Wood Badge, and other Scout related subjects. You can view samples of their work on their web site. I think the Wahunsenakah buckle is the nicest one they have ever produced!